Rafael Benitez's decision whether to stay on as Newcastle manager will depend on the amount of funds he is given to strengthen the squad. 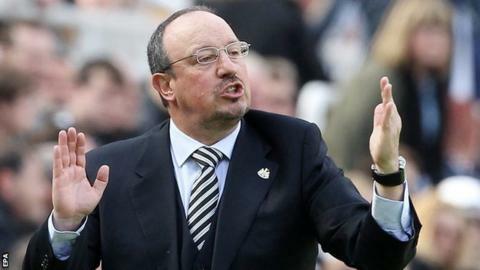 Benitez took over in March but could not stop the club being relegated, despite the Magpies winning three of their last six league matches. He could now activate a clause in his deal which allows him to leave. However, he has held talks with the Magpies hierarchy, with talks described as positive. Benitez replaced Steve McClaren with the club in 19th and the Spaniard was in charge for 10 top flight games in all. "My heart is telling me yes, it is a great opportunity, city and club," the former Real Madrid boss told BBC Sport after his side's 5-1 win over Tottenham in their last game of the campaign.